American smoke tree is a small tree or large shrub and displays some of the showiest fall colors from yellow to red to purple. From a distance, the spent flowers give the tree a "smoky" appearance. Smoke tree is a drought tolerant plant that will do best in sunny, well-drained areas. Too much water or rich soil will be detrimental. It naturally grows on glades or bluffs. A: Hopefully. We've had poor seed germination the last 2 years and/or rodents ate our seeds before they had a chance to germinate. I don't expect we'll have any plants before next fall. Nevertheless, you could check back next June to see if we're having better luck next year. 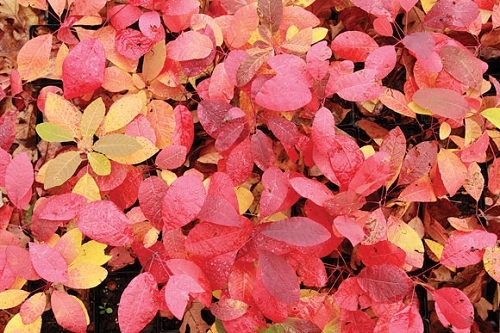 Q: Is Cotinus obovatus dioecious? A: Yes, trees have either male or female flowers.